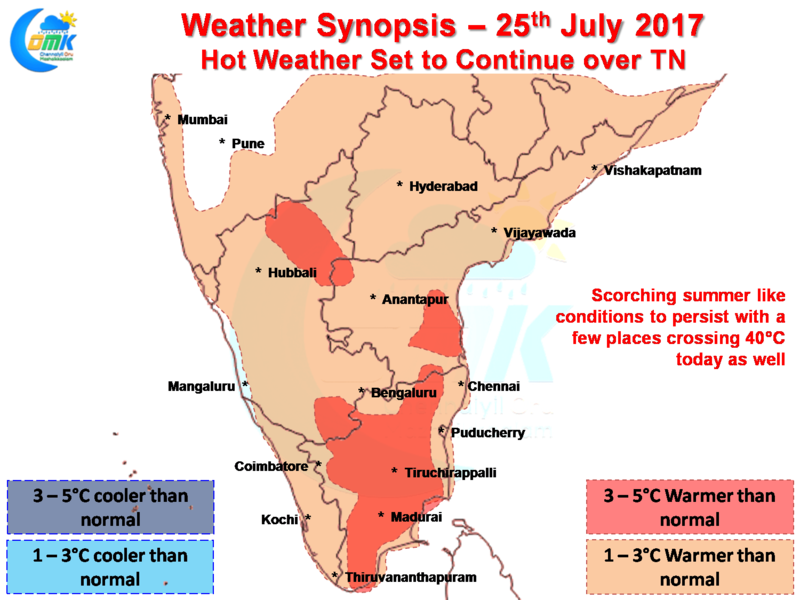 The Blistering Weather conditions over most parts of Tamil Nadu continues to prevail for the past few days with day time conditions resembling summer days than peak Southwest Monsoon Period. Yesterday Madurai recorded a fourth straight day of 40+ maximum temperature recording 41.6 once again for the second day in succession equaling the hottest temperature recorded ever during July. Going by how most models are estimating the temperature anomalies there is a fair chance for Madurai to have a crack at setting possibly the hottest July day either today or tomorrow. Yesterday Tiruttani became the sixth IMD observatory in the state to record 40 this July after Madurai, Cuddalore, Thanjavur, Trichy & Vellore. With the way things are shaping we could see another one added to the list among Chennai, Nagappattinam & Pondicherry. South Tamil Nadu is bearing the brunt of the poor monsoon prevailing over Kerala with just dry Westerlies pushing in along the gaps in Western Ghats. While we are not yet in the stage of expecting evening thunderstorms to pick up on a regular basis, the wheels in motion are setting up as the Low Pressure in West India weakens and the Well Marked Low moves along the trough over the next few days and ceases to be an influence bringing the next Break in Monsoon period. In the meanwhile models indicate the possibility of some isolated rains over North Coastal Tamil Nadu between the SHAR & Pondicherry stretch. The possibility for Chennai will depend on where the thunderstorms form today. Let us keep our fingers crossed.